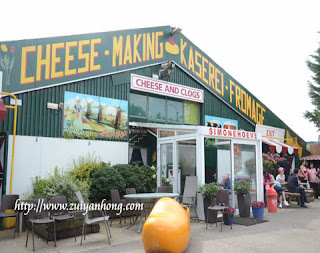 We were heading to Simonehoeve Cheese and Clogs Farm after leaving Volendam Fishing Village. Because Simonehoeve Cheese and Clogs Farm is near to Volendam Fishing Village, we moved to the farm after savoring the fragrant coffee in Volendam Fishing Village. Upon arriving at the factory, we were led to a workshop for making clogs. The man in the picture showed us how a pair of clog was made. 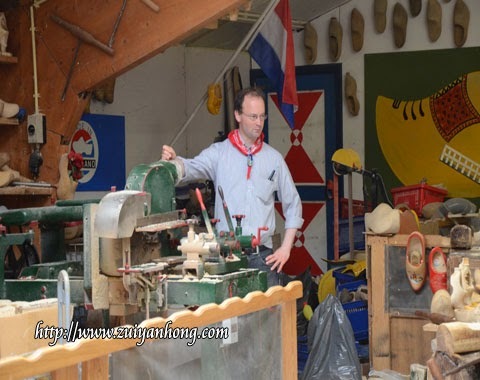 His skill of making clogs was truly amazing. There were many different designs of clogs hung on the wall. 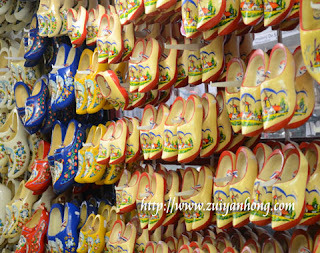 These colorful and attractive clogs were ready for sale to the visitors. You may either put on the clogs or keep them as souvenirs. 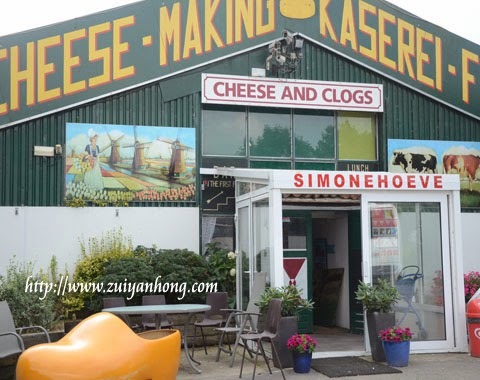 Besides making clogs, this farm also produce the renowned Netherlands cheese. After watching clogs making, we proceeded to the cheese showroom. Various sizes and colors of cheese were displayed on the rack for sale. The cheese slices in the plate were for customers to taste. 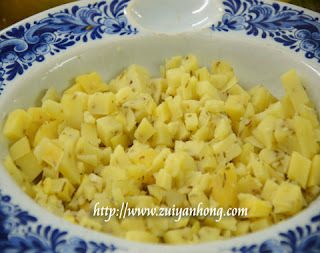 There was a wide range of flavor of cheese available. You can buy the cheese you like. I never expect the trip to Europe enable me to witness the process of making clogs. It's proven that traveling able broaden one's vision. If you don't want to be a frog in a well, you have to getting around here and there.